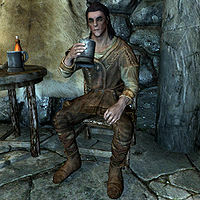 Kodrir is a Nord lumberjack who lives and works at Anga's Mill. He works with Leifur for the owner of the mill, Aeri. He sleeps in Anga's Mill Common House. He wears a belted tunic and a pair of boots. He is equipped with an iron dagger, and carries a key to the common house as well as a selection of lower-class items and gold. He gets up at 7am to start eating his breakfast and does so for one hour. Then he goes out to the mill where he works chopping wood, sharpening axes, and running for water. After a whopping twelve hours of work, he heads home to eat dinner, then he finally goes to bed at midnight. He's very unfriendly, as the only things he will ever say to you are, "Strangers are always trouble." or "I don't need to talk to you. Get lost." Kodrir: "I swear that woman Aeri doesn't appreciate all the work I do for her damn mill." Leifur: "Oh, I've heard this one before. Watch out Divines, poor Kodrir curses you all for giving him life!" Kodrir: "Watch your mouth with me you pup! Who do you think you are?" Leifur: "The man doing your job?" This page was last modified on 30 December 2017, at 03:19.